Many spectroscopy papers appear these days where the source of radiation is one of the several Synchrotron Radiation sources available throughout the world. These sources are few in number and expensive to run, so the obvious question is “why do people go to the trouble of moving their entire infrared experiment to a huge fixed facility, a long way away and spend large amounts of money to run their spectra?” The answer of course lies in the properties of the radiation available from a Synchrotron Source. Synchrotron radiation is emitted when high-energy electrons are deflected as they pass through a magnetic field. This phenomenon constitutes a considerable nuisance to the designed of high-energy accelerators since it drains away the energy of a particle beam, but it has properties which make it an excellent research tool in many areas of science. 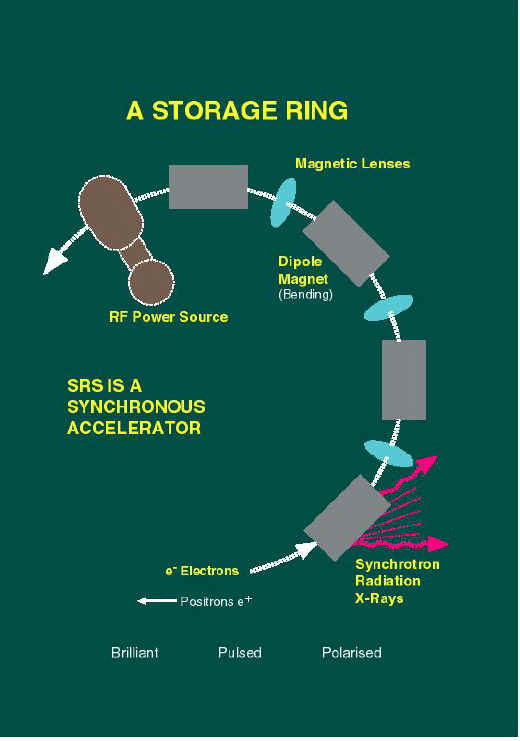 A storage ring is a high energy electron accelerator devoted to the production and use of synchrotron radiation, and the general method of production of radiation from such a Synchrotron Radiation Source (SRS) is shown in Figure 1. Figure 1. Schematic of a storage ring showing the production of synchrotron radiation. Figure 2. Spectrum of radiation from a storage ring source. has a precise time structure related to the radio-frequency of the accelerator system. The short wavelength cut-off in the spectrum is determined by the radius of curvature of the electron beam in the magnetic field and hence by the magnetic field strength. 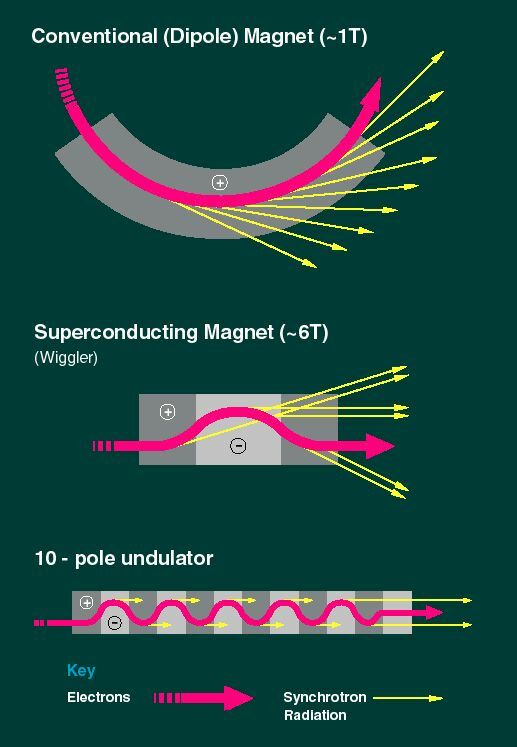 At one point in the ring there is a super-conducting Wiggler magnet with a magnetic field (6T) higher than those in the storage ring dipoles; electromagnetic radiation of shorter wavelength is produced at this point. At another point on the ring the beam passes through a series of magnets of alternating polarity – an ‘undulator’ – which causes undulation about its mean orbit as it passes through the pole gaps. The radiation emitted in successive undulations adds coherently, so the intensity of the low energy x-ray spectrum is greatly enhanced at this point. These methods of producing radiation are shown schematically in Figure 3. Figure 3. Methods of producing radiation in the storage ring. 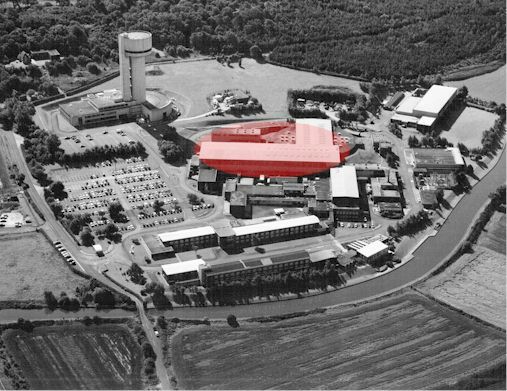 The world’s first storage ring source was built at Daresbury in Cheshire in the UK, and an aerial view of the facility, showing the location of the ring and experimental area is shown in Figure 4. Figure 4. The UK Storage ring building at Daresbury, Cheshire. The storage ring and experimental area are shown by the red circle. The overall layout of the ring and experimental area is shown in Figure 5. Figure 5. Schematic view of the storage ring (R) and experimental areas (E). L = linear accelerator; B = Booster ring; see text for use of areas labelled *. Electrons emitted from a hot cathode are first accelerated to 12MeV in a linear accelerator and injected into a booster synchrotron to raise this energy to 600MeV. Finally they are injected into a storage ring, where the energy is boosted to 2 GeV. The beam will continue to circulate for 20 hours or more in the high vacuum of the storage ring before more electrons need to be added. At suitable points on the ring, ports allow the radiation to shine down evacuated pipes into the experimental stations, each having an optical system to focus the beam into the experimental apparatus. Synchrotron sources are all similar but users are very dissimilar in their demands. Some users are interested in the X-rays, others in the visible etc. The management of the facility has built a series of systems on each of these beam lines designed to assist particular requirements and a large amount of data recording and processing equipment is permanently sited at Daresbury. In many cases some of the experiments people want to do can be run on the Daresbury equipment, and they do not have to transport their spectrometers to Warrington. They do, of course, have to take their samples and any cells they may need to contain them. Considering the mid infrared – the two properties that people find most useful are the intensity (or brightness) and the polarisation. The high brightness means than when there is a shortage of signal (the experiment is ‘noise limited’) they think of Synchrotron Sources. Infrared microscopy is notoriously difficult in some cases because the efficiency with which the infrared radiation passes through the microscope is low. The subject was aired in the last Edition [See ijvs.com/volume2/edition4/section1.htm]. Further, the low energy means that the time required to record a spectrum through a microscope is relatively long. This doesn’t normally matter very much but if one is trying to scan an infrared map of a sample this time problems adds up to very long experiments indeed. The Synchrotron source speeds these measurements. Fast kinetic measurements or dynamic ones are frequently impossible using conventional sources and FTIRs in macro scale absorption or reflection measurements. Again the Synchrotron source is invaluable. Conventional infrared sources approximate to ‘Black Body Sources’ i.e. their emission falls on one of the plots given in Figure 6. As you can see, it is advantageous to have the source as hot as is practicable but the emission at long wavelengths is very poor indeed and is contaminated with overwhelming amounts of radiation at shorter wavelengths. The latter can be reduced with filters but the lack of intensity cannot be corrected. As a result, far infrared spectroscopy has always been a problem area. Operating much below 300cm-1 has always required high quality instruments and results have been slow to acquire and are of poor quality. Again, the use of Synchrotron radiation provides an advantage. 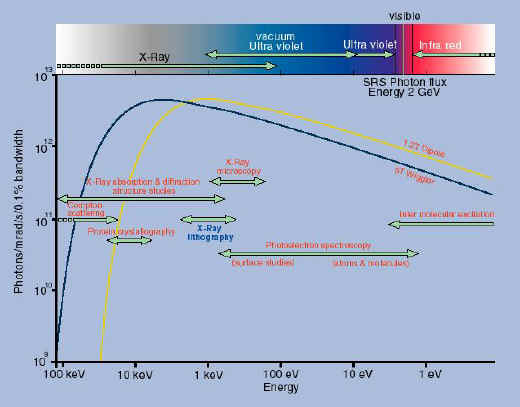 Although the reader’s interest is in the near mid and far infrared, others users exploit different wavelength ranges. For example, radiation in the vacuum UV can be used to study the electronic structure of short-lived species using vacuum violet photoelectron spectroscopy. For these studies synchrotron radiation is extracted from a beam port and passed through a 5m normal incidence mono-chromator which allows the users to select radiation in the wavelength range 400-2000Å. 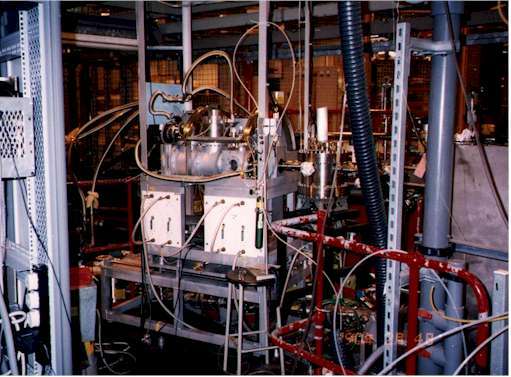 A purpose-built photoelectron spectrometer which is used to study short-lived intermediate of atmospheric importance (like SO, CS, OH, O2(1Dg)) is shown in the photograph. Emission from the monochromater on the right of the photograph passes through the cylindrical interface chamber and then into the spectrometer. Figure 7. A photoelectron spectrometer used for studying the structure of short-lived species with synchrotron radiation. This apparatus has been used in the experimental areas labelled * in Figure 5. Measurements on the photoelectron spectra of species of the type listed above enable important electronic and vibrational parameters to be determined. Ionization energies leading to various ionic states of a particular species can be determined, as well as information on the vibrational structure of a particular electronic ion. This in turn can provide important information on the bonding character of an electron involved in the ionization process.